When it comes to PC Optimization, images of snake-oil and con-men often come to mind, and indeed the problem of fraudulent or misleading software is pervasive in this genre and many other software genres. Bitsum does optimization along with much more, like automation. We never did it the classical way — You know, registry cleaners and useless or even harmful ‘features’. (side note: If you want to use a registry cleaner, it’s fine, but its for your own psyche, not actual performance). In general, I hope we can all agree that those old style utilities like ‘RAM defragmentation’ (ROFL) are totally useless, and detrimental to performance. Now, here I must profess to creating SmartTrim, but I only very reluctantly created SmartTrim because the other RAM management products were so dumb. They just whack every process on the system, forcing a page out of all memory, then the actively referenced virtual memory pages get paged right back in within milliseconds (hopefully!). Users were asking, and I had to provide something better, so I did. It acts selectively and with precision. Still, it is disabled by default in Process Lasso, and is only recommended for the rare user who truly does need to have a process paged out (note that watchdog rules can also be used in Process Lasso to page a process out when it exceeds X consumption). So, I focused my optimization on what we were already doing, automation. I wanted to optimize based on real-time user behavior. And so I did. ProBalance was born. Process Lasso was born to contain it. And ProBalance turned out to really be a winner, an optimization we can demonstrate in both real-world and synthetic tests, which is rare. I wanted to optimize based on real-time user behavior. And so I did. ProBalance was born, an optimization we can demonstrate in both real-world and synthetic tests, which is rare. Therefore, since Process Lasso and other projects contain optimizations, here I am in this genre. In the last 20 years I’ve learned a lot about it. As I see it, there are these camps of people (of course they can change as they evolve and learn), and in-between is the truth. These people believe the Windows OS’s management of all hardware resources is superior to any third-party, so it should be left alone entirely. This is a class of people who know that in certain circumstances, third-party software can either be more intelligent than the OS, or enable the user to be more intelligent than the OS. Why? How? Because the OS doesn’t really know what your user intent is, but the user does, or some optimization software might. The user and high-level software has a different awareness than the OS, which is not an AI – it is just trying to appropriately juggle threads. It is also far from perfect, as we’ve demonstrated here at Bitsum more than once. Heck, Intel took over core parking in Skylake (6th Gen) because the OS just couldn’t do it well enough. Not necessarily the OS’s fault, but it is the case none-the-less. In short, you know what you are doing, and what you are about to do, so can tune your PC for that. This is NOT justification to do/try any random tweak and hope for the best, but it is justification to pragmatically explore your options. These people have unfortunately went down the rabbit hole of tweaking, trying to get a marginal performance boost, but often do more harm than good. They sometimes oscillate between good and bad performance as they try different things, or random interactions with multiple optimization applications occur. As with so many things in life, the truth lies in the middle. I think this reasoned argument should prove persuasive, though does not answer any individual question about ‘should I tweak X’. That answer depends on a lot of factors in a very complex software ecosystem. What do you think? 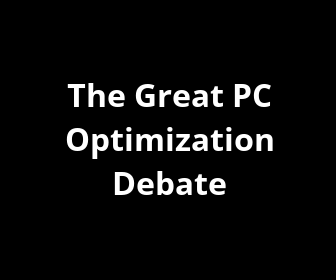 Is Real-Time Optimization alive, or is all PC Optimization a relic and we should leave it to the OS and apps? Comment below.